The Burren and Cliffs of Moher has successfully retained its Geopark designation for a further period following a reassessment and revalidation by the UNESCO supported Global Geopark Network. The designation is subject to review every four years and an assessment, which was conducted by Dr. Klaus George from Germany and Dr. Margaret Wood from Wales in County Clare in June. The announcement was made this week at the 13th European Geoparks Conference 2015 in Rokua Geopark, Finland. 18 Geoparks were up for revalidation with 16 receiving green cards, including the Burren and Cliffs of Moher and the Copper Coast Geopark in Waterford. Three new Geoparks, namely Pollion (Italy), Sita (Greece) and Troodos (Cyprus) were accepted bringing the number of European Geoparks to 69. Global Geopark status was first awarded to the Burren together with the Cliffs of Moher in 2011 for their outstanding geological and cultural heritage and has resulted in the region joining a global network of over 100 Geoparks worldwide. The Geopark is managed by Clare County Council and receives support and funding from the Geological Survey of Ireland and Failte Ireland. “Clare County Council has been working in the Burren since 2008 to develop a truly sustainable tourism destination that gives direct benefits to the local community. This work has led to Geopark status being awarded to the Burren and the securing of vitally important EU LIFE funding,” stated Cllr. James Breen, Cathaoirleach of Clare County Council. “This collaborative approach, combined with a good working relationship with communities throughout the Burren has established the Burren as the thriving, sustainable destination it is today,” he added. 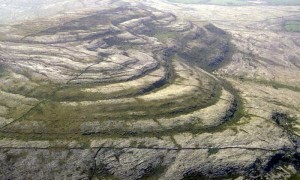 “We are delighted to have successfully retained our designation for a further four years which will enable us to continue our work, with the support of Clare County Council, the Geological Survey of Ireland, Failte Ireland, the Burren Ecotourism Network, local businesses and the community to establish a solid, sustainable and vibrant tourism infrastructure in the Burren,” Ms. Gleeson added.